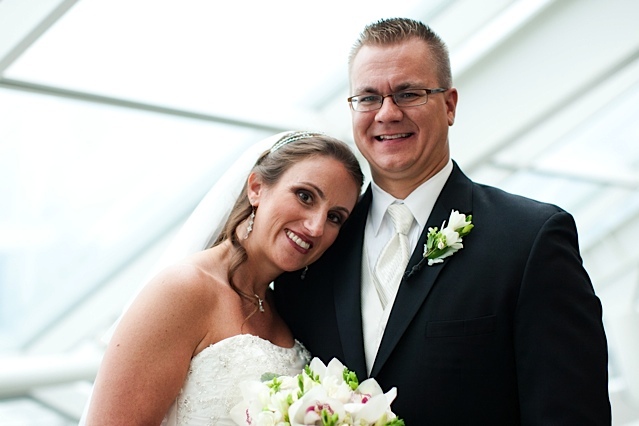 Sara and Greg got married at the Adler Planetarium in Chicago last year. Sara was hoping for a beautiful sunny day but the weather didn’t cooperate as she hoped. 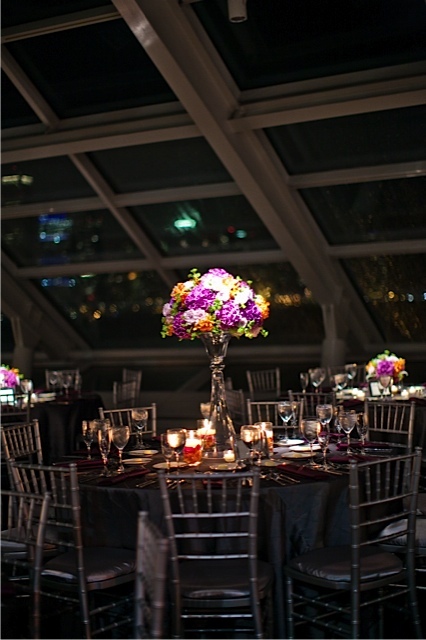 However, the Adler has THE best view of the skyline in Chicago therefore we decided to move the wedding indoors. 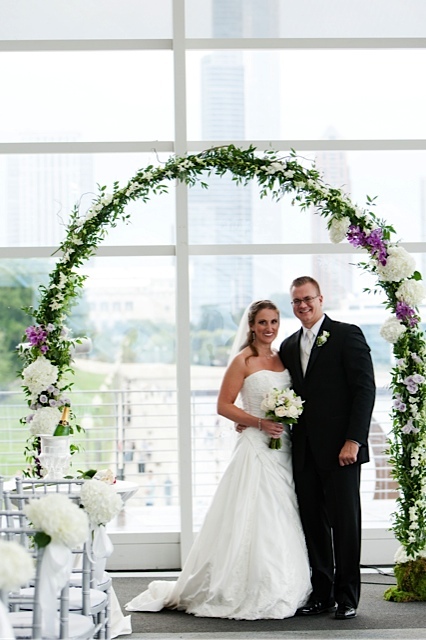 We created a beautiful arch of dendrobrium orchids, italian ruscus, sterling silver roses and purple mokara orchids. 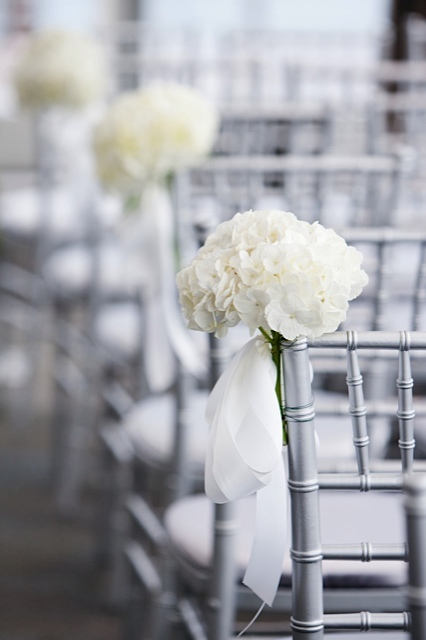 We decided to keep things simple down the aisle with clusters of white hydrangea and a wide aisle runner since the view of the city was going to be part of our ceremony “backdrop”. 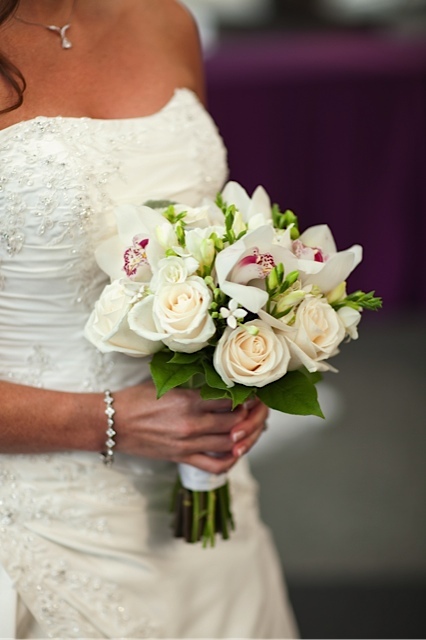 Sara carried a gorgeous bouquet of white roses, white bouvardia, white cymbidium orchids, white freesia and salal leaves. 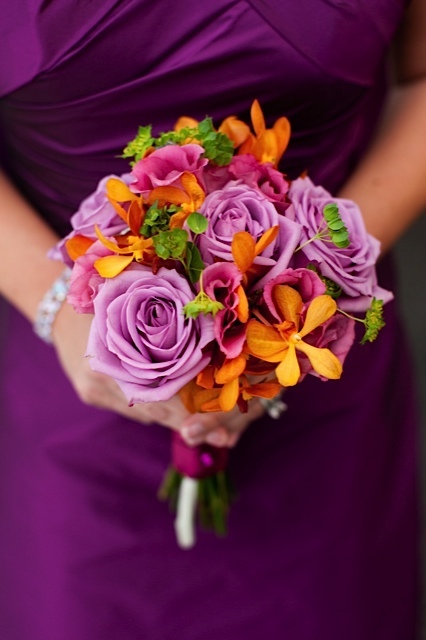 The bridesmaids carried bouquets of cool water roses, bupleurum, and orange mokara orchids. It had quite the pop against their plumberry gowns. 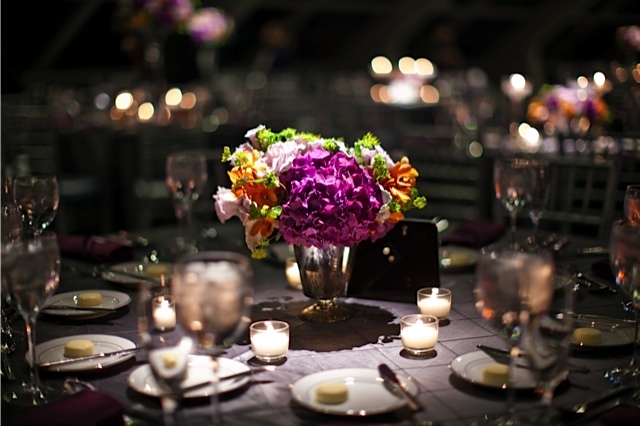 For the centerpieces we created three different looks with silver revere bowls, mercury glass pedestals and a tall reversible vase – one low, one medium height and a tall arrangement. 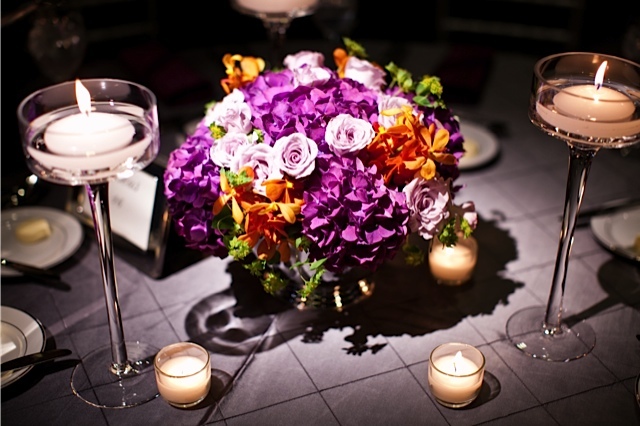 All with the same mix of purple hydrangeas, sterling silver roses, orange mokaras and little touches of green bupleurum. To our delight the planner for this wedding Sara hired a lighting designer to pin spot our centerpieces. 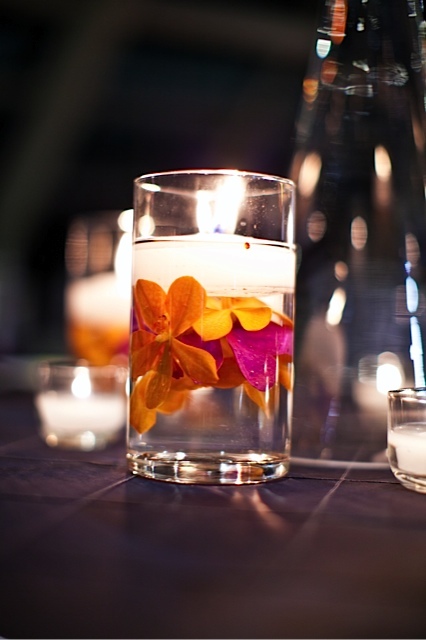 You can meet Alexandra Jusino of Exquisite Designs and learn from other fabulous designers like Tara Guérard, Matthew Robbins, and even take a workshop with Ariella Chezar from the Flower School of NY this March! We’ve had many wonderful new attendees sign up this past week, so hurry and reserve your spot! Sign up for the Chapel Designers School NYC on the sidebar. Hi Sheena, the arch is actually made of really thin tubbing. We created a skeleton of curly willow and covered it with italian and israeli ruscus. After that it was pretty easy to add orchids, hydrangeas and other flowers to the overall frame as the curly willow served as my web to support the flowers. Glad you like it!